i am glad to be unemployed but i miss my coworkers at Souldier! connie is in a band ReDeMeR and this is their tshirt. 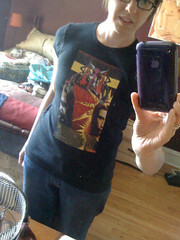 it is so cool to have a tshirt with someone i know's face on it! i took this picture for lexie so she would be jelous.